Hailing from New York, Martin Basher is a multidisciplinary artist that frequently exhibits his work between the Big Apple and New Zealand. From the 5th of February to the 7th of March, Basher holds a solo exhibition “Jizzy Velvet” at Starkwhite Gallery on Karangahape Road. Martin Basher’s exhibition explores hyper consumerism and it’s effect on our environment. 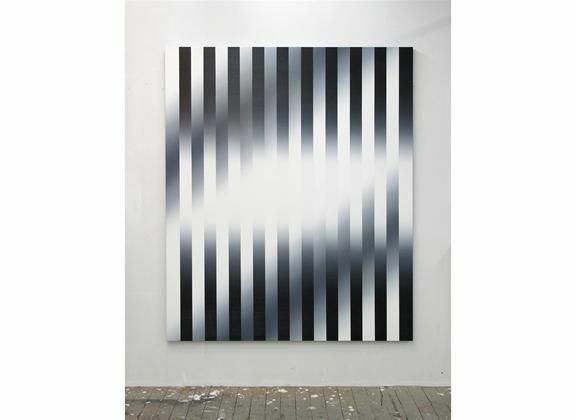 This is shown through his large scale paintings hanging on the walls; canvas and cardboard painted on with bold stripes and gradients – producing complex optical illusions as if the surfaces were reflective or metallic. The floor of Starkwhite Gallery holds sculptural works that reference the purposeful arrangement of architecture and space of retail stores and window displays. It is most definitely one of the best shows on in our city. We highly recommend taking take a trip to see this stunning show before it finishes next month.